For the first time this season the Gonzaga Bulldogs are at full strength. Junior forward Killian Tillie made his season debut against Santa Clara on Saturday. Tillie had been sidelined since undergoing surgery for a stress fracture in his ankle back in October. Joining him on the court Saturday was senior guard Geno Crandall, who was making his first appearance since November after recovering from a hairline fracture in his shooting hand. 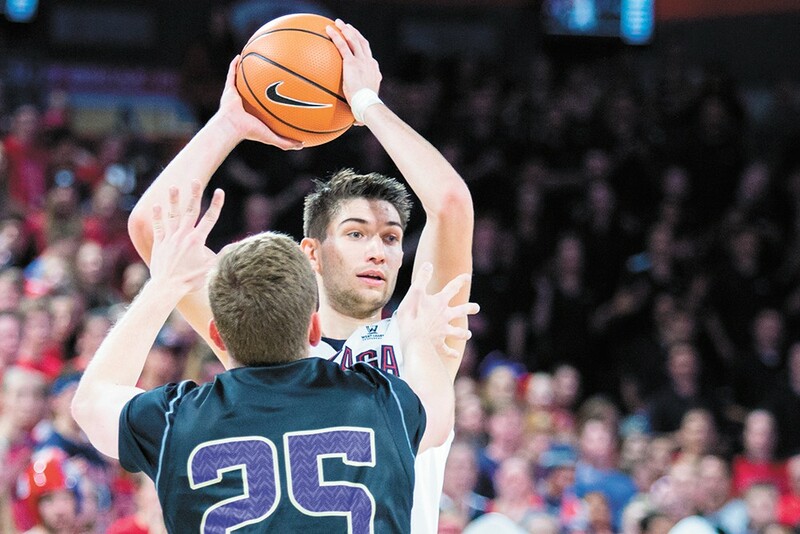 In many ways, Saturday’s game against Santa Clara was the start of a new season for Gonzaga. Not only was it the first time we’ve seen the Zags at full health, but it was the opening game of West Coast Conference play for the squad. Unlike most years, the West Coast Conference won’t be a cakewalk for Gonzaga. So, getting to full strength right now is critical. Five of the WCC’s 10 teams entered conference play with 10 or more wins to their name. A sixth, Gonzaga’s arch-rival, the Saint Mary’s Gaels, reached that mark on Saturday with an 88-66 drubbing of the BYU Cougars. Those two teams, traditionally the only real challengers to Gonzaga, aren’t the reason the league is going to be so tough this season. It’s the rest of the league. The teams that Gonzaga normally feasts on during the months of January and February. Loyola Marymount, which last defeated Gonzaga on Feb. 18, 2010, is 13-3 so far this season. The Lions play a hard-nosed defensive style and have a dynamic scorer in senior guard James Batemon (18.4 points per game). They’ve already picked up wins over historic college basketball powerhouses UNLV and Georgetown. San Diego, which last defeated Gonzaga on Feb. 22, 2014 — that was the last time Gonzaga lost to a WCC team other than BYU or Saint Mary’s, and that was 1,780 days ago — owns a 12-5 record. Head coach Sam Scholl, a Gig Harbor native, has a veteran-laden team with an array of capable scorers. The Toreros have already defeated San Diego State, a team that defeated Gonzaga last season, and two Pac-12 teams in Colorado and Washington State. But the biggest threat of all is the San Francisco Dons, who play host to Gonzaga this Saturday at 7 pm on ESPN2. San Francisco was a juggernaut of the sport from the 1940s through the '80s. During their heyday, the Dons won three national championships: in 1949, 1955 and 1956. In recent decades the Dons have been nowhere near their former glory, but third year head coach Kyle Smith has the program trending in the right direction. This year’s San Francisco team, which has a 14-2 record just like Gonzaga, might just be the best since Ronald Reagan was president. Fourth year point guard Frankie Ferrari runs a tight offense with an athletic wing in Charles Minlend and a trio of big men capable of pounding in the paint with the Zags. Starting center Jimbo Lull, a true 7-footer, is a full 4 inches taller than Brandon Clarke, the Zags’ starting five-man. On the other end of the floor, the Dons rank as one of the best defensive teams in college basketball. This season they’ve held opponents to just 28 percent shooting from three-point range, 10th best nationally, and 45.2 percent shooting inside the arc, which ranks 37th nationally. Gonzaga, for comparison, ranks 42nd and 26th nationally in those respective categories. Over the summer, the WCC abandoned the double round-robin schedule format it had used for the past few seasons, shrinking the conference slate from 18 games to 16. That move was seen as a way to appease Gonzaga, which was unhappy having to play so many games against the relatively weak competition in the WCC. One way that impacts the conference schedule is that every team will have two weeks with just one game, rather than the usual two games per week schedule. Last week, Gonzaga had Thursday off. This week, it’s San Francisco that won’t hit the hardwood Thursday. Long story short, the Dons have a full week to prep for Gonzaga. The Zags? They have to face Pacific on Thursday before traveling to San Francisco. Coach Few says his team would be challenged by the league slate. He’s right, and we’ll start to see that this week.